Risk management is a business tool for forecasting potential risks, and then identifying ways to either prevent these issues from occurring, or minimising their impact. When sketching out a business plan or scoping your next project, looking out for potential disaster is never high on your list of priorities. Risk management is so crucial to the success of any business undertaking or project. Without it, you’re simply crossing your fingers and hoping that all goes to plan. To show why it's important to take the time to implement risk management procedures, we've outlined 6 key risk management benefits below. Risk management enables you to identify factors that may negatively impact your business or project. You can then either put prevention measures in place, and / or develop actions for response if any of these factors should occur. A clear risk management plan will denote ownership of each action, and clearly outline the responses required by each person. This enables a consistent response to any issues that may occur. When developing a risk management plan, the contingencies are built into your overall scope, and all stakeholders are aware of what steps must be taken, should any of the identified risks occur. Risk management plans and logs are useful from both an operational and strategic perspective. They serve as useful tools for leadership teams for review and forward planning. No one understands your business or project better than you do. Creating a risk management plan specific to your upcoming projects or day-to-day business is a highly tailored way to identify challenges. Risk management helps to build trust with stakeholders. It creates a clear outline for all involved in a project, and helps to manage expectations, should any factors negatively impact the project. When you consider these benefits, you’ll really begin to see why Risk Management is actually the best way to work towards success. 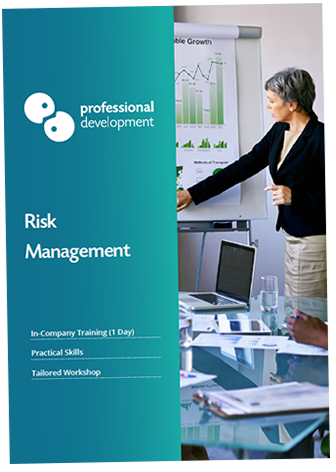 Our 1-day Risk Management Workshop is available for in-company bookings. We deliver a workshop tailored around the challenges your business or project may potentially face, and work with your team to identify the potential risks, and use best practices in implementing contingencies. You can find out more about how this can work for a project management or leadership team of any size by clicking below to download the workshop brochure, or ask us a quick question. Whilst our focused Risk Management workshop is only avaialable for in-company (group) bookings, we have excellent options for those who want to attend a public training course. You can learn a little about these courses, and click to connect with each one and find out more below. Our Certified Project Management Course is a highly practical project management workshop, with a focused risk management module. Risk Management is also covered as part of our PMP® Exam Preparation course. Those working towards PRINCE2® certification on our 5-day course will cover Risk Management. Blog » Project Management Blog » What is Risk Management?